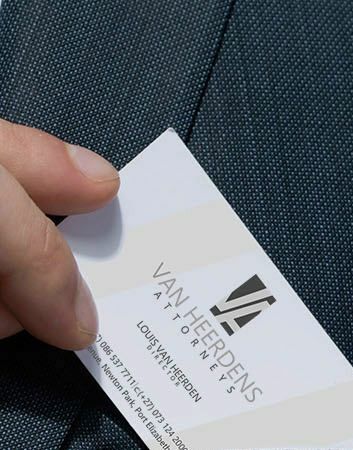 Van Heerdens Attorneys is dedicated to excellent client service, providing a full range of legal services. We are ideally situated and configured to deliver the highest quality service to our clients, regardless of the complexity of the legal issue. At Van Heerdens Attorneys we are constantly testing the boundaries of conventional methods of practising law whilst maintaining efficiency and exceptional levels of service. We understand the meaning of building long term relationships with our clients and therefore treat each client’s case in accordance with our own personal values of professionalism, honesty, integrity, respect and compassion. We provide general legal advice and cover all aspects of litigation (which is formal court action). Court procedures take a long time to finalise and the outcome is never guaranteed. We, however, aim to use creative methods to settle disputes and to prevent lengthy legal battles. We provide a variety of family law services, such as: uncontested & contested divorces, pre- and post-marital contracts, and custody and access issues. Everybody should have a Last Will and Testament. Even if you have nothing right now, the time will come when you will accumulate assets. If you die without a will, your assets will be dealt with according to the law of intestate succession, irrespective of what you might have wanted to happen to your assets. If you have a Will you can appoint someone to deal with your assets according to your instructions. We provide debt recovery services whereby we pursue payments of debts owed to our clients by individuals or businesses. Often the bad debt is in respect of a lease agreement, whereby our clients may also elect to evict the defaulting tenant from their property. The Consumer Protection Act has had a profound effect on the way we conduct business in South Africa today. Businesses are forced to undergo substantial changes so as to ensure compliance with the Act. The Act imposes stringent penalties on companies that do not comply, which has resulted in many companies having to review and redraft their business contracts. If you or a family member have been arrested or charged with a crime, you should contact an attorney immediately. We will assist in protecting your best interests throughout your experience with the criminal justice system, from time of arrest to finalisation of your matter.